With a handful of rookies struggling on the weekend, Fry points out which ones to cull and who deserves another chance before Round 4. It was only a matter of time before 40’s and 50’s started to litter our sides as the rookie scores saw a lot of coaches come crashing back to earth in Round 3. With the reserve competition’s up and firing and some cash cows fattening close to their full price, it’s time to start the annual tradition of identifying the right downgrade targets. Clark failed to record a handball in his third pro game of footy, but he did manage to finish with 12 touches. He faces a tough task against the Giants this round and we might see the lowest score of his career for the second straight week. Don’t panic though, Clark still has plenty of room to grow. Those who were worried about Scrimshaw being dropped due to his conditioning woes will be happy to see him put up one of the better rookie scores in the backline this weekend. Of all the ‘popular picks’ Scrimshaw’s 64 was among the highest, which is saying something considering how bad the other DEF’s performed. Alright, we got greedy. Duursma started the year on fire and we were all jumping for joy when he topped triple figures vs Carlton. He came crashing back to Earth though with just 15 up to half-time against the Lions causing some coaches to wonder if the app was malfunctioning again. He’ll bounce back. Melbourne failed to get a win on the board, but that didn’t stop Jay Lockhart from opening eyes on the Friday night stage. He needed two goals for his 67, but doubling his output from last week has a lot of coaches eager to bring him in. Despite having a week off between games, Jordan Ridley is on the verge of entering “Get ‘Em” status. He has recorded half a dozen marks in both his contests this season and could use a few +6’s to make coaches some money in their back six. If you want to get on him, then you’ll need to do so soon and a decent score against Brisbane could see him come in for a handful of coaches. After shining with 70+ against Fremantle, Collins reminded us why picking a Gold Coast Sun is never a smart tactic. He’s nothing more than a bench cash cow in my eyes and in a few weeks, he’ll be perfectly ripe for the picking. A similar thing could be said for Callum Wilkie after his second straight, average outing. With his three games coming against Gold Coast, Essendon and Fremantle it’s hard to see him lifting his output significantly, that is if he even holds his spot in the side. Well, well, well, hello there Markov. His 73 and 20 touches caught a lot of us by surprise as he flipped his score from the previous week after a lacklustre 37. He doesn’t have the best track record of scoring though, so don’t fall for the trap. A 36 point first half piqued the interest of some coaches…and then it was gone. Only Tom Hickey spent less time on ground than Rotham for West Coast and he should make way for a returning Eagle this weekend. If you followed my advice last week and ditched McKay, well done. If not, time to jump ship. Isaac Quaynor (Magpies, $246K) – He is still a bit away from likely entering the side, but Quaynor’s doing the right things posting a 60 on the weekend from 19 touches. Awkward price. Harrison Jones (Hawks, $170K) – Game-high 97 points for Box Hill scoring in a variety of ways (kicks, marks, tackles). Potential downgrade option if named, albeit unlikely. Lachlan Scholl (Crows, $170K) – A whopping 109 points from 34 disposals has Scholl throwing his hat into the selection ring. His numbers as a junior gathering the footy were encouraging, highlighting why Adelaide spent the 64th pick on him last November. Harry Petty (Demons, $239K) – You couldn’t touch him at his current price, but may come in for his second career game after playing on a minutes restriction. Marty Hore (Demons, $181K) – Similarly to Petty, Hore only played a portion of the game but recorded 52 points from 14 touches (13 kicks). Those owners who held will have their fingers and toes crossed. Top of the cash cow food chain, Sam Walsh scored his first of many fantasy tons on the weekend finishing with 28 touches, a few marks/tackles and his first career goal. I’m still baffled that over a quarter of the competition doesn’t have him. Complete package. One of the most popular trade targets this week, Sydney Stack grasped his chance on debut with both hands. He played Colts footy for Perth last season for the majority of the year (averaging 23.4 touches in 11 games) and in his three senior games he posted just 14 touches a game, so don’t go expecting regular 80’s. Still, given Richmond’s injury woes he should see a boost in his job security and will continue to roam one of the Tigers’ wings. If a popular bench rook is dropped, Stack’s your answer. These were the type of scores coaches who invested in Bailey Smith were expecting! The junior stud found his fantasy feet in Round 3, recording a career-high 22 touches and six tackles for his 85 points. It’s worth keeping an eye on Smith during a matchup against Collingwood, but I wouldn’t be risking it off one decent score. Yet. While the Roos appear keen to get some games into their younger kids, you tend to feel Thomas will be omitted this week. Just eight touches against the Lions won’t likely see the top-10 pick hold his spot in the 22. Speaking of omitted, LDU will experience the full force of a rage trade from 5% of the competition. He nearly scored 60 points worse than the week before, with a handful of coaches experiencing deja vu after his uninspiring 2018 campaign. He still has some value, but I’d wouldn’t be giving him too many more chances. Right Bailey, we need to talk. Yes, your 97 in Round 1 was a thing of beauty, but the last two weeks are not acceptable. You gastro became contagious making owners sick against Brisbane, but there were no excuses this week. If you somehow hold your spot in the team, we want you to know you’re severely on notice and this type of s*** will not be tolerated. Sincerely, 42% of the AFL Fantasy community. I wouldn’t go rushing to trade Corey Wagner into my fantasy side just yet, but it’s good that he’s at least back on the park (glass half full right?). He didn’t instil his owners with a ton of confidence moving forward and if I was in that boat, I’d proceed with caution. You aren’t at the bottom of the “Watch ‘Em’s” for doing anything wrong Zak, but I just can’t fall for you. His consistency has been nice for the owners who started Port’s youngster and a matchup against the Tigers might provide him with an opportunity to showcase his fantasy ceiling to the rest of the comp. In case you weren’t aware, a mark+kick+goal is worth 12 fantasy points. Tom Atkins recorded one such +12 within the first few minutes of last Thursday’s clash and proceeded to gather just five more touches in the entire game, with no other meaningful stats. Gross. Fantasy footy just isn’t as easy for some as others. Jones is one such player who struggles to fantasy. If you’re an owner and didn’t deal him last week, put your mind at ease before he goes down in price again. If, like me, you own both Tom Atkins and Michael Gibbons on your bench, then things are not looking up. One underperforming bench rook is hard to swallow, but when Gibbons can’t help the duo combine for 50, you’re in trouble. Unless he miraculously holds his spot, send him packing. James Rowbottom (Swans, $222K) – 114 points sounds great on paper, but let’s not forget the NEAFL scores are seemingly multiplied by three. Rowbottom still deserves a shoutout, but I can’t see him cracking the Swans rotation just yet. Kai Pudney (Power, $170K) – Power youngster Kai Pudney still appears a long way off, but if he keeps putting up 30 touches and 100 points, Ken Hinkley will be forced to look a little harder at handing him a debut. Tom North (Freo, $170K) – Should Nat Fyfe fail to get up for the Derby, my gut tells me Ross the Boss is going to give one of his young kids a baptism of fire. Fresh off 26 touches, 10 tackles and an impressive 115, Tom North might be the guy. Jack Ross (Tigers, $170K) – Trent Cotchin’s hamstring injury paves the way for Jack Ross to make his debut this weekend after another solid showing in the two’s with 82 points from 21 disposals. Patrick Wilson (Crows, $278K) – 25 disposals, 88 points and a goal will keep Wilson in the selection frame, but he’s destined for more SANFL games. Jackson Hately (Giants, $244K) – You feel like Jackson Hately is a certainty to play senior footy before the year is over, however, it won’t be in a big clash against Geelong with Callan Ward the next midfielder in line. Nick Shipley (Giants, $170K) – Ditto for Shipley, who needed 27 touches for his 98 on the weekend. Will Hayes (Bulldogs, $170K) – The Bulldogs midfield is firing right now making to difficult for Hayes to enter the selection frame, even after 97 points and 24 disposals. This wasn’t exactly what Clarke owners wanted from the born again Bomber. He helped contribute to the Dons win, but only had 13 hitouts and rose a grand total on four grand in value. If he holds his spot, don’t go trading him out and hopefully, he can bounce back. It might be a bit harsh not putting Reilly O’Brien in the ranking above, but can you really warrant spending $60K on upgrade a bench spot? He toiled hard, but I can’t see O’Brien playing more than one or two games before Sauce reclaims the ruck mantle. Sam Draper (Bombers, $170K) – Essendon’s VFL side had a HUGE win last weekend and Sam Draper likely took home the three votes. With 133 points, 22 touches, 39 hitouts and two goals, there’s a lot to like. Jordan Sweet (Bulldogs, $170K) – Not a great showing with 27 hitouts helping him total 69 points. Archie Smith (Lions, $217K) – Almost mirroring Sweet (69 points, 28 hitouts) we’ll need to see more if Smith is to come into consideration. Darcy Fort (Cats, $170K) – Travelling emergency didn’t suit up in the VFL this weekend. Matthew Flynn (Giants, $170K) – Played second fiddle to Dawson Simpson with just eight hitouts. Great VC loophole helper though. Darcy Cameron (Swans, $170K) – His 17 touches were a highlight, helping Cameron total 92 points. I would like to take this chance to formally apologise to Connor Rozee. The kid can play, we knew this, but we (I) had doubts over what type of fantasy game he could produce. If the answer is more performances like he threw up against Brisbane then boy oh boy. Even if you take his five goals away, Rozee still finished with a score in the 90’s. Jet. I’ve been a big fan of Miers (even if I continue to butcher his name) since his TAC cup days. He showed a great nous for the goals against the Crows and while we can’t expect three snags on a weekly basis, Miers is quickly coming into our thinking as a starting option. Here’s my last line re Parker last week: “I’ve said it before, I’ll say it again though a score in the 40’s is coming“. I’m not about to call myself a rocket scientist, I mean it was pretty obvious to predict regression from Parker after his stellar beginning to the season. There’s still room for him to grow though and this was the first week he failed to kick a major. He’ll survive. I hate to do it, but after a dull effort like that Drew’s spot in the Power side is suddenly questionable. I have faith that he can hold his place, but much like his fellow, former cash cow sensation Duursma, he needed to junk it up late after barely scraping to double-digits in the first half. If his numbers continue to falter with Wines back in the side, Drew’s going to be on the way out. West Coast youngster Jack Petruccelle didn’t look out of places under the bright MCG lights, posting his second solid score in a row. There is still some fear over his low possession style of play, but if 13 of his 14 disposals are going to be kicks, that’ll ease our anxiety somewhat. Good news, bad news. Starting negative, a score of 43 won’t ensure last week’s debutant Dylan Moore will play again in Round 4. Good news though, despite his lack of production he did total five tackles, saving what could have been an awful outing. Don’t bring him into your thinking until teams are revealed as Jarryd Roughead’s return could see him ditched. Fielding Chris Burgess would be a silly idea, but if you own the popular cash cow he can still make you a bit more coin. 40-45 feels like the right range for his average and in another 2-3 weeks he can make you a decent chunk of change when he is likely culled. Still sitting in 65% of teams, things are starting to trend downwards for Setterfield. His second straight 50 has caused doubts over his ability to be fielded and if he keeps dishing these types of games up, he’ll have to make way for a more reliable option. I wouldn’t make trading Setterfield a priority, but I’d start to bring it into my thinking. Even though Blakey managed to surpass his breakeven, by the skin of his teeth I might add, if I was one of the 5% of coaches with him in my side I’d remove him swiftly. Copy and paste my above messages about players struggling to fantasy football properly, not picking Gold Coast Suns players and some other negative reason to trade out Lukosius, who is still looking for his first AFL goal. Those coaches who held Noah Balta after he was dropped clenched their fist and did a little pump of excitement when he was named on Thursday. Unfortunately, they then proceeded to bury that fist into their 70″ plasma after watching him against the Giants. Good ‘ol Relton Roberts 2.0 got us twice! Remove him ASAP. James Rose (Swans, $223K) – Rose had a day out for the Sydney two’s side kicking four goals and gathering 39 touches in his mammoth 135 point total. Mitch Lewis (Hawks, $170K) – Finished with four goals and 71 fantasy points. Monitor him especially if he’s named. Sam Sturt (Dockers, $238K) – Has had his name floated as a potential debutant for a few weeks, but didn’t exactly ‘wow’ with 20 disposals and 82 points for Peel. Lachie Schultz (Dockers, $243K) – Was left out of the Freo and Peel side on the weekend. Let’s not get carried away with one special performance at the Gabba. I mean Sam Walsh scoring a ton deserves credit as well and it wouldn’t be fair if I gave my vote to Rozee considering he isn’t in my side. That being said a five-star, five-goal haul will deservedly see Port’s new stud be one of the most traded in players this round. Taking price, scoring potential and job security into consideration, here are my top 5 ranked rookie/cash cow options for Round 4 (starting next week, now that we have a decent sample size, I’ll be providing a top-3 ranking at each position). Good Luck for Round 4! Thanks, Fry, for dissuading me from taking LDU last week. I had some bad luck here and there, but things could have been much worse if I committed to this crock. Wish I could afford Rozee this week. Who to field stack or butters? Great article, thanks Fry! Assuming I have no one being dropped this week, I am looking at Setterfield to Stack and playing Parker F6 (multiple bench DPP movements in that trade), and then Atkins to Libba. Takes my banked cash but seems like a decent move. Imagine not starting with Libba!!!! $392K, and absolute bargain. I wasn’t missing out on that!!! Which two should I field out of setterfield, petruccelle, miers and parker. Top article again Fry. Keep up the great work. Great effort, Fry and very easy to read & interpret. 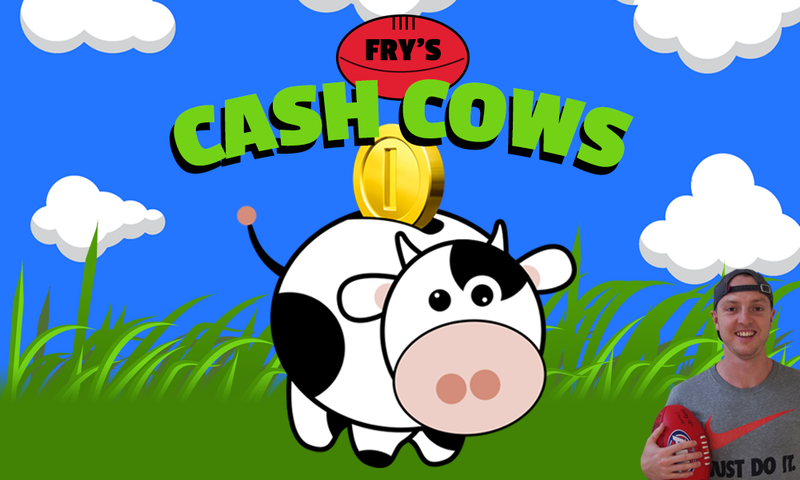 One problem: for all three rounds I have not been able to use the Cash Cow King survey. I keep getting a pop-up saying: Please choose a valid poll answer. Thinking of going Cousins to Stack field Constable and go Powell to Dahlhaus, Marshall or Daniel. I have 11k in the bank currently before those trades. Thanks as always Fry – have found your articles over the past few years really well written and intelligible, cheers. is it worth getting rid of drew now? Any ideas on this McIrniney bloke for Sydney? Fry, brilliant article again. Do you see Zac Clarke getting many games this year? Would be a valuable addition, if he’s in your side now I’d hold him until after tham at least in case he does appear in a few games. Thanks mate. Keep up the solid work.